4Runner's spacious interior has its visible focus on comfort and utility. Thoughtfully equipped with advanced features and unique functionality, the refined interior makes 4Runner the perfect vehicle for everyday use. Whether navigating the outback or the urban wilds, 4Runner’s available voice-activated navigation system can help get you there and back again. The large 6.1” touchscreen manages the display from the back-up camera, as well as read-outs from the vehicle management systems. 4Runner Trail Edition features an overhead console that organizes all off-road control switches one easy-to-reach location. 4Runner’s impact-absorbing body efficiently and effectively channels impact energy around and away from the passenger. 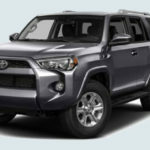 Additionally, in the event of an impact with a pedestrian, 4Runner has specially constructed zones in the hood, fenders and cowl that form a Pedestrian Protection Structure that are designed to crush on impact, absorbing energy in order to reduce potential injury. In the event of a rear, 4Runner is equipped with standard Active Control front headrests that automatically move up and forward to reduce any whiplash effects. for you & your passengers. 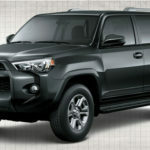 4Runner features 8 standard airbags, including front, side-seat mounted and knee airbags for driver and front passenger, and side curtain airbags for the front and rear.